You can access video of the first parts of the meeting here. Apologies in advance if you feel you made an eloquent and impassioned speech which seems to have been reduced to a mere bullet point ! Roland seems more interested in balancing the books. No stability of managers or players and too much interference over the last year. Sense of ambition has been lost. Apathy. We must have dialogue. What are his plans ? Without their insight we get silly ideas like Valley Express needing to break even; programme sellers dispensed with; people paying for a £150 seat and sitting in a £450 seat. Loyalty, which is needed when results are bad, is lost. No credible answer to West Ham Olympic Stadium threat. We are told there are no puppets at CAFC but we can see the strings. Investment in facilities all very well but, if I want to see friends and family, I prefer the pub. You can only break even in The Championship by reducing wages. Will the revised training ground ever happen ? Previous funding no longer in place ? There is no quick fix solution, but we would never have got back to The Valley if we hadn’t organised. I was supportive of Duchatelet for the first nine months. Peeters sacked. A magical shortlisting and interview process. Riga should have got the job. If he had, there would have been a bond with players and supporters. A week later he turns up at Liege. It is like Roland is playing Football Manager. The goal now seems to be not to aim for Premier League or take fans on board. ITTV posters say - Look at the Pozzo family network. We see Watford doing well. Therefore no problems with networks per se. Why are we messing around changing programme sellers to save a few quid ? Why not talk meaningfully to the organisation with over 1000 members and 5000 contacts ? Aims and objectives of CAS Trust include giving all fans a voice and representation. We participate in the Fans Forum but we are independent. KM saying 'not favouring any supporters group' translates as not forming a proper relationship with any part of our supporter base. We’ve never felt so alienated as now. Jury is out on network model, but to work it must be more open and more honest. The current unclear business plan fosters speculation and mistrust. We feel we have exhausted all options available to establish communication with Katrien. We have the option of seeking dialogue with Roland but Katrien has made it clear that she is the only conduit. Where is the next generation of Charlton fans coming from ? Do you want to support an independent football club or do you want to support the London franchise of a European sports network ? I want Charlton to be independent. Therefore I think our purpose should be to find ways to persuade M Duchatelet to sell up and leave. “Duchatelet and Meire have completed the destruction of the family feel begun by Jiminez and Slater, and some of the efficiency. If one looks, for example, at the shambles of the programme selling and the misjudgements on refreshments in the East at least”. “We have not become a feeder club as many feared, in fact we have benefited from players coming to Charlton. While some have not been up to the mark, others certainly have. Players that in our recent past would have beeb beyond our reach in both terms of transfer fees and wages. While I don’t like the revolving door policy concerning managers, there are positives. Most noticeable are investment in youth and a pitch which allows football to be played on”. “The quality of the communication coming from the club is very poor. There appears to be no understanding that we need to pull together as one. Comments from the CEO have not helped”. “The sheer number of managers in little over one year indicates a lack of interviewing techniques vs what is required”. “I would like to give Guy Luzon some advice. A manager must take the fans along as well as the team. How can he possibly leave the arena on Saturday with absolutely no rapport with the fans. We won 3-0 and he did not look up to the Covered End or anywhere else in the ground to smile and put a fist in the air or show some pleasure with the fans before he left”. “The owner should accept that he does not really know a thing about The Championship of English football (or football at all?) and listen to proper advisers – not the ones he relies on at the moment”. “My main concern over the last year has been the lack of respect shown towards the supporters by M. Duchatelet. There has been no meaningful attempt at dialogue”. Many people are fed up and saying they will not renew season tickets next year. Can CAS Trust try to keep in touch with those people so that we can rebuild when the tragectory is upwards again ? We wouldn’t be in the position we are in now if the club still had a supporters’ representative on the board. I walked away from Tottenham because a lot of the things happening here now were happening there in the mid 80s. Are people here this evening prepared to support a proper club in a lower division ? Do I want to be part of a network ? Not really, but I didn’t see a queue of people wanting to buy the club. We shouldn’t rush to judgement. We should see how Luzon gets on. We shouldn’t be walking away. This meeting is a great gesture. If it brings dialogue closer then it is a success. We shouldn’t be shutting any doors. The Trust has got to find a way to bring younger fans and occasional fans on board. You need to have short term goals but also long term measurable goals. The current ownership does not make us more secure. He could walk away tomorrow. The network idea is complete nonsense. A long-term aim would be to have a supporter back on the board. The desire from supporters for a sense of partnership with the club is emotional, but it also makes massive commercial sense. We haven’t turned our back on the club – look how many people have turned out tonight. The club has turned its back on us. We are just a quaint backdrop to a player farming process. I’m not interested in communication because I don’t believe in the communication we have at the moment. I don’t want to understand what Roland wants. I want to see a team that wants to win, that tries to win and is going to win. Roland Duchatelet has got to go. Let’s get our Charlton back. This evening is a good response but I am worried that the energy could dissipate. What are we going to do specifically if we are met with intransigence ? Would we be here tonight if we were still up in the league ? It might take years to reach the Premier League like Cardiff and Leicester. He didn’t have to improve the pitch. We need to find a way to stick together and get behind the club. I have a lot of time for Richard Murray. He stressed last night at the VIP meeting that Duchatelet has put money in and has a plan. He said that, if he didn’t believe that Duchatelet was good for the club, he wouldn’t remain as a director. I’ve always believed that the owners of a club should be supporters of the club. I don’t want to be Manchester City. I took huge pride in our step-by-step progress under Lawrence and Curbishley. If you look at Cardiff and Blackburn you can see examples of supporters who did manage to bring about change. I don’t want an owner who thinks he can pick the team. Younger people will not come along to meetings like this. They need something on a match day to get involved with. Trying to engage with Roland is a waste of our time. You go to your local corner shop. You might get things cheaper elsewhere but it is your shop. I don’t want to support an offshoot of a big corporation. We need to have bright ideas, be funny and witty and get media attention. I’m not happy with crap players and poor communication but be careful what you wish for. Think of Coventry and Portsmouth. Duchatelet should listen to people like Richard Murray, Damien Matthew and particularly Phil Chapple. There are so many changes that it must affect the way they play. The old Charlton values went out of the window when they got rid of Chris Powell. Should we be aiming for a fan-ownership model like Swansea ? Do we have respect for M Duchatelet ? We call him by his first name. We must get Richard Murray on side. I had a banner taken off me and was threatened with a ban from the stadium. I want us to do well but I want us to be the old Charlton. I think we must pursue sensible dialogue, but, if not, can we find other parties who might want to buy the club ? Q: Should we take no action at the present moment ? Q: If we won the next five games, should we still take some action ? Q: Should we continue to try for dialogue ? Q: Should we forget dialogue altogether ? We can’t have 200 people agreeing a strategy. The Supporters Trust should take the lead. Don’t boycott season tickets, but boycott the concessions. Influence the sponsors to gain dialogue. Contact box holders. The evening closed with a collection towards the cost of the meeting. CAS Trust is grateful to all who attended and those who made written submissions. The extent of the good will towards the club which was exhibited at the meeting. 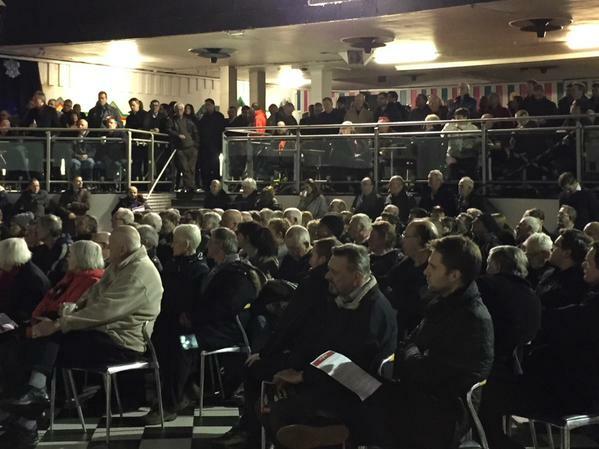 The determination of the meeting that CAFC regains its reputation as a well-run club enriched by supporter involvement. The overwhelming desire of the meeting for continuing attempts at meaningful dialogue with the club.